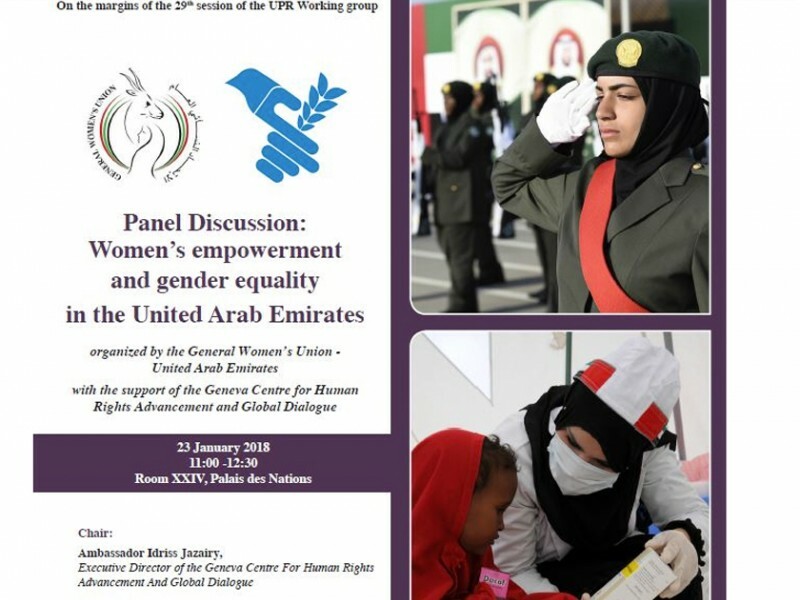 GENEVA, 24th January, 2018 (WAM) -- International officials participating in the UN Human Rights Council meetings, currently being held in Geneva, have highlighted the UAE's leading role in women’s empowerment and gender balance. Several senior women’s rights experts praised the efforts of H.H. Sheikha Fatima bint Mubarak, Chairwoman of the General Women's Union, GWU, President of the Supreme Council for Motherhood and Childhood, and Supreme Chairwoman of the Family Development Foundation, FDF, to empower and support women, as well as her desire to achieve gender balance. During a discussion session on advancing the process of women’s empowerment in the Gulf region, titled, 'Women’s Empowerment and Gender Equality in the UAE', held on the sidelines of the 3rd Universal Periodic Review of the UAE’s Report on Human Rights, the experts valued the UAE’s efforts to advance women’s empowerment and improve gender equality. The session, which was organised by the GWU with support from the Geneva Centre for Human Rights Advancement and Global Dialogue, saw the attendance of Noura Al Suwaidi, Director-General of the GWU, and Reem Abdullah Al Falasi, Secretary-General of the Supreme Council for Motherhood and Childhood. Chairing the session, Idriss Jazairy, Executive Director of the Geneva Centre, highlighted the need to conduct an open and balanced discussion on the obstacles hindering women’s empowerment and gender balance, in light of important relevant achievements. "However, the process of achieving equality in all parts of the world is still out of reach," he added. He also praised the efforts of Arab countries to promote wider participation in the decision-making process, noting that over 60 percent of the gender gap in the Middle East and North Africa has been reduced, according to the Global Gender Gap Report published by the World Economic Forum in 2017. Regarding the UAE’s efforts to help achieve this goal, Jazairy went on to say that the UAE is one of the leading countries in the region in terms of women’s empowerment and gender equality, due to its adoption of UAE Vision 2021, which aims to place the nation among the top 25 countries in terms of achieving gender balance by 2021. Jazairy noted that UAE Gender Balance Council plays a key role in planning the procedures for adopting the gender balance process in all relevant policies while pointing out that women play an increasingly important role in all aspects of life in the UAE. Following Jazairy's statements, other key speakers presented examples of the UAE’s successes of improving gender equality and advancing women’s rights.